The tail end of summer is the taste of a juicy, luscious melon. Look for a yellowish spot on a melon; it's the "groundspot" where the melon fell from the vine – and a good signal of flavor. The last, luscious drips of summer are hiding beneath inscrutable skins: yes, melons are still in season at our local markets. Even though nothing says summer like watermelon, sliced and making a mess of children's faces at a picnic, this and other melons are actually late summer/early fall crops in our region. Hermiston is the watermelon capital; any Portlander here for at least one summer knows that. Melons thrive in the hot, dry conditions of that Eastern Washington region, as well as in the Snake River Valley and the Medford area. 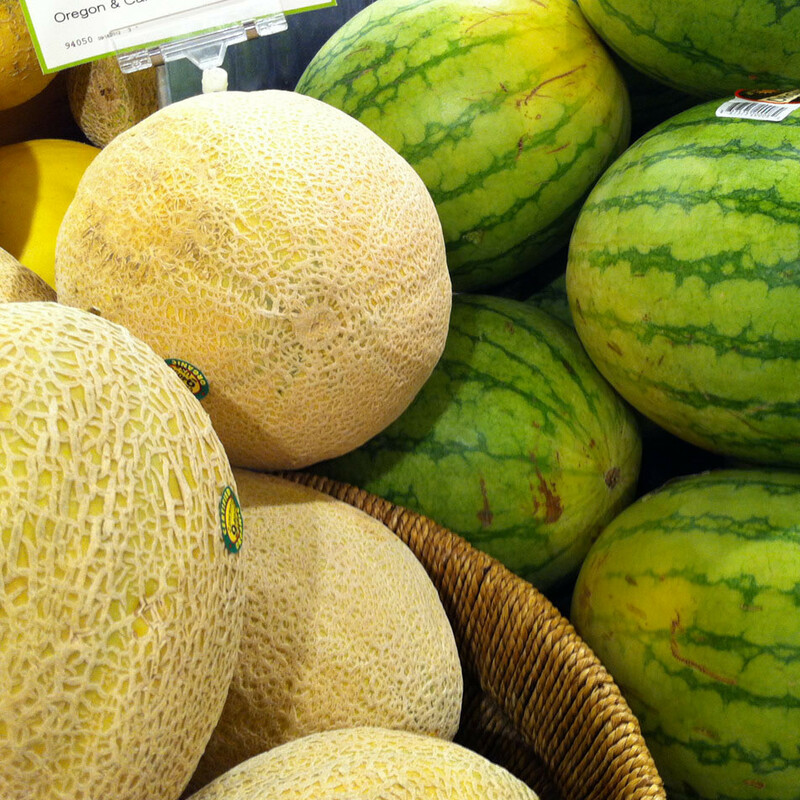 Honeydews, muskmelons (more commonly known as cantaloupes), casaba and crenshaw melons are some of what you'll find. Look for the "groundspot" as a sign of a sweet, juicy melon, no matter what type it is. The yellowy spot is where the melon fell to the ground when it ripened. Bigger is also generally better. While any ripe melon is ready for the slicing, there are other things to do with them. Simple salads are best, but they need not be sweet. Why not try a savory mix of unexpected flavors? The late summer combo of watermelon and tomato is one of these. Honeydew mixed with cucumber, mint, and red onion, dressed with olive oil, lemon juice, salt and pepper is another; check it out below. Mix together honeydew melon, cucumbers, red onion and mint in a large bowl. Add olive oil and toss to coat. Stir in lemon juice, salt, and pepper to taste. Cover and refrigerate until chilled, about 40 minutes.